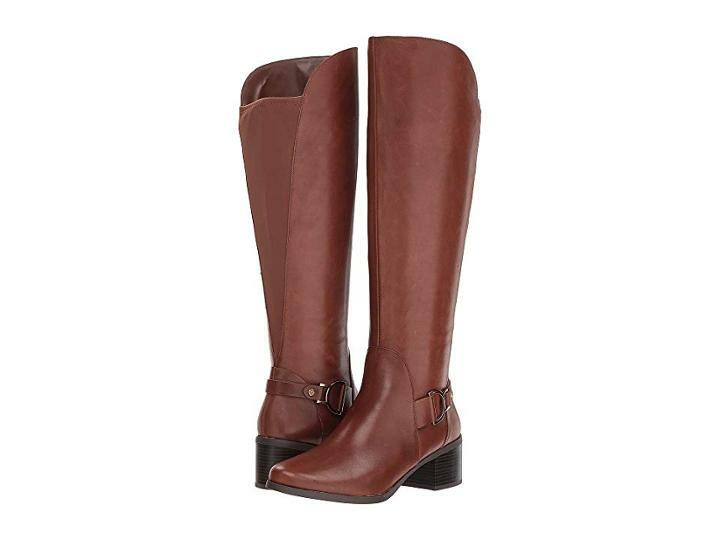 Inspire your everyday look with the polished Anne Klein Jamee Riding Boot. Leather upper features a smooth finish. Pull-on design with half-zip closure. Classic round toe. Stretch back panel for added comfort. Strap with harness buckle at ankle. Breathable man-made lining. Lightly cushioned footbed lends to long-lasting wear. Dual lightweight foam layers provide cushioning and shock-absorption. Low stacked block heel. Rubber sole creates a durable stable shoe with superior traction. Imported. Measurements: Heel Height: 2 in Weight: 1 lb 1 oz Circumference: 15 in Shaft: 18 in Product measurements were taken using size 9 width M. Please note that measurements may vary by size. Weight of footwear is based on a single item not a pair.